Forgiveness. Pardon, pity, mercy, absolution. I want you to write for me forgiveness, in any guise you wish. 1. 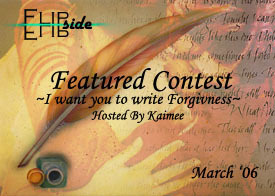 The theme of your piece must center around or focus on forgiveness. This doesn't mean that you can just throw the word 'forgive' in there somewhere, I want themed pieces. Other than that, *shrugs* if you're old enough to write it then I'm old enough to read it. I ask that any members with mature content post warnings on their pieces. Entries will be judged by me, according to sheer brilliance :P Correct spelling and grammar will heighten your chances of your story appearing brilliant, although if you're a good enough writer they may not get in the way. *shrugs* Your choice on that, I just tend to enjoy correct spelling and grammar more. I also tend to enjoy the creative, rather than the predictable, please; work on that. If you do not adhere to the word/line count limitations you will be disqualified. If you break the rules you will be disqualified. My say is final. 1. [Po] - with enthusiasm! 7. [Talenya] Hope I can give you something worth while in the reading. 9. [Calann] Hopefully sooner than later. eg. [Kaimee] 5.Contest Entries.Grandmother, 730 words. 1. [Mister Saint] 79.Contest Entries.Judge Me Not, 566 words. 2. [Kuzco] 212.Forgiveness, 800 words. 4. [kileaiya] 172.Contest Entries.I want you to write forgivene, 516 words. 2006-02-16 [Metal Tsubasa]: Now, you say it's based on forgivness... but can it be about not giving that forgivness? 2006-03-29 [Kaimee]: it is to be closed soonish, so hurry up and get your piece in if you're going to :P I'm closing it the second I have enough time, probably at the end of the week. 2006-03-29 [Calann]: Alright, I'll try my best, and if I don't get it done by the time when you come upon that second... Oh well. Is the end of the week synonymous to, say, Saturday or Sunday?